O.J. Simpson was a popular American football player who, on his retirement in 1978, became a popular actor and a spokesman for various organizations. Having divorced his first wife by whom he had three children, Simpson married Nicole Brown, 12 years his junior, on 2 February 1985 and had two more children. During and after their separation Nicole had made at least 20 calls to the police in fear of her life. At 4.30pm on 12 June Nicole, 35, attended a dance recital at her daughter Sydney’s school before going for dinner at 6.30pm at a Brentwood trattoria called Mezzaluna, where 25-year-old Ron Goldman was a waiter. Nicole’s mother left a pair of prescription sunglasses there and Goldman offered to return them. At 9.45pm he went home to change clothes before heading over to Nicole’s home where they were both brutally butchered. A neighbour discovered the two bloody corpses at 12.10am on 13 June. One forensic examiner said, “[Nicole] was virtually decapitated. Her jugular was all but completely severed by a gash inflicted from the left side of her neck to her right ear.” Goldman’s throat was slashed and he was stabbed 19 times in the torso. At 11.45pm Simpson had flown to Chicago to attend a business conference. Police searched Simpson’s estate at 360 North Rockingham Avenue and Detective Mark Fuhrman found a bloody right hand glove, which matched one found near the two corpses. Unfortunately the police had not waited for a search warrant. 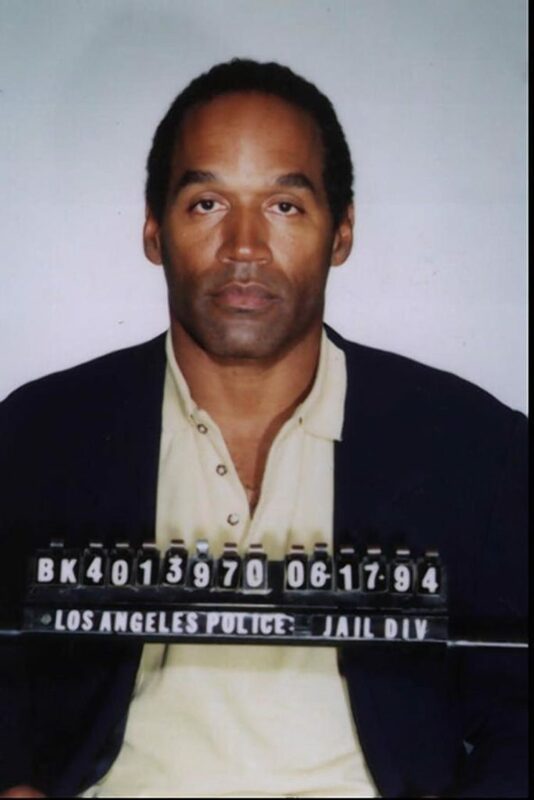 Simpson was arrested at his home on 17 June 1994 after a slow-motion chase which began at 5.51pm and was watched live on television by millions, ending at 7.57pm. “The trial of the century” began before Judge Lance Ito on 24 January 1995 with Simpson defended by the so-called Dream Team of Johnnie Cochran, Robert Shapiro and F. Lee Bailey, among others. During the trial Detective Fuhrman was accused of being a racist who had framed Simpson and Simpson refused to don the bloodstained gloves. At 10am on 3 October 1995 Simpson was acquitted of both murders much to the shock of many. The jury had taken just five hours and four minutes to deliberate. On 5 February 1997 at a civil hearing Simpson was found liable for both deaths and ordered to pay the Goldman family $19.5 million. He never paid a cent. On 13 September 2007 in Las Vegas Simpson and a group of men retrieved sporting memorabilia they claimed had been stolen from them. On 3 October 2008 Simpson was found guilty of 12 charges of armed robbery and kidnapping regarding the incident.